Sometimes these collages come together really easily, and other times things just don’t fit! I actually had an entirely different Under $100 roundup ready to post today, but decided yesterday afternoon I didn’t love it. It just wasn’t cohesive enough for my liking – Type A gal, over here! So I scrapped that post and started fresh. Opting for a neutral palette is never a bad idea, in my humble opinion. I started with this plain white tee and built it up from there! I’ve had a bunch of people ask lately how I make these collages – the answer is Adobe Photoshop. If you have any more blogging-related questions, be sure to check out my Blogging Tips section. There are four VERY in depth blog posts sharing the nitty gritty on how to start a blog, how to build a following, how to engage with brands, so on and so forth. Enjoy! Great picks! Love the leather jacket! Love that bag & the little striped dress!! 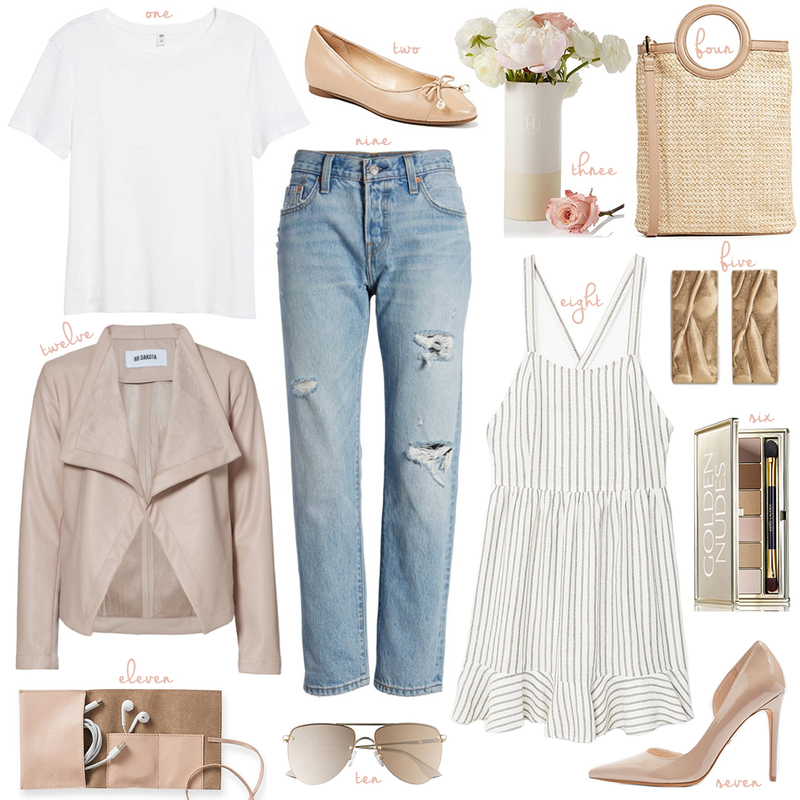 I’m loving the neutral color palette! Love those jeans and striped dress! This post is perfect timing–I was just looking for a jacket in the exact style of that BB Dakota one yesterday! I thought I had seen you post about it before and was literally googling “style scribe moto jacket, style scribe assymetrical jacket” haha. love the neutral tones. totally want the dress.